College students attending another institution having a grade-point average of C (2.0 on a 4.0 scale) or better and eligible to return to their own colleges or university may be admitted as transient students. Transient students must download, print, complete, and submit a Transient Student Admission Application. A transcript of previously taken college course work may be requested at the time of registration to verify good academic standing at the home institution. ***You must submit a copy of your current college ID card and you will be able to register once our priority registration has ended. Students who do not plan to return to their own colleges are not considered transient students and should apply for admission as transfer students. 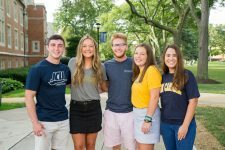 Students interested in non-degree admission who do not have an baccalaureate degree should complete this form: http://webmedia.jcu.edu/admission/files/2019/04/Non-Degree-Seeking-Application_updated-1_28.pdf and return it to the Office of Undergraduate Admission. Many individuals choose non-degree seeking either to explore the seriousness of their interest in studying for an advanced degree and/or to strengthen their credentials for a future degree application. Others are interested in taking graduate course work for personal enrichment or professional development. Students interested in pursuing coursework at the undergraduate or graduate level, who already possess a baccalaureate (or higher) degree may apply for non-degree admission through the Graduate Studies Office http://sites.jcu.edu/graduatestudies/pages/graduate-programs/non-degree-seeking/.